Description: This book chronicles the history of music for the organ from its beginnings in Greek and Roman times through its development in mediæval times to the beginning of the 20th century. It contains biographical details of Italian, German, English, French, Dutch and Spanish composers together with some examples of their work. Williams, Charles Francis Abdy. B.A. (Cantab, 1879), M.A. (Cantab, 1882), Mus.B. (Oxon, 1889), Mus.B. (Cantab, 1891). Studied at Sherborne School; Trinity Hall, Cambridge, 1875; the Leipzig Conservatory under Dr Karl Reinecke, 1882. Organist of St. Mary’s, Auckland, New Zealand, 1879-81; Dover College, England, 1881-82; St. Mary’s, Boltons, London, 1885-91; Bradfield College, Berkshire, 1895-. Composed church and chamber music, songs, &c. b. Dawlish, England, July 16th, 1855; d. Milford, Lymington, Feb. 27th, 1923. Antiquity of the organ – The hydraulus and its music – Differences between ancient and modern music – Rapidity of execution referred to by ancient writers – Ephemeral nature of instrumental music in general – Three periods of modern organ music. CHAPTER II. FORM IN MUSIC. Necessity of form – Dance music – Early forms of organ music – Music and architecture compared – Harmony and counterpoint – Rise of tonality – Rhythm and popular music. CHAPTER III. ITALIAN ORGAN MUSIC. Landino – The several kinds of ancient organ – Organs at St. Mark’s, Venice – Zucchetti – Organum magnum and organum parvum – Organist and organ-builder – Sguarcialupo – Willaert – Buus – The music at St. Mark’s – The earliest printed Italian organ music. CHAPTER IV. ITALIAN ORGAN MUSIC (continued). Merulo – Palestrina – Gabrieli – Popular tunes in church – Diruta – Il Transilvano – Toccatas – Use of the stops Antegnati – Italian organs and organists of the sixteenth and seventeenth centuries. CHAPTER V. ITALIAN ORGAN MUSIC (continued). Frescobaldi – Directions for the proper performance of his music – Rossi – Fasolo – Other Italian organists of the seventeenth and eighteenth centuries. CHAPTER VI. GERMAN ORGAN MUSIC. The rise of organ music in Germany – Paumann – His Fundamentum Organizandi – Compass of German organs – Hofhaimer – Increase in the number of organs – The Koch family – Arnold Schlick –Spiegelder Orgelmacher – German Tablatures – Kleber – Coloratura –Ammerbach – Popular tunes set to sacred words. CHAPTER VII. GERMAN ORGAN MUSIC (continued). The Schmids – Origin of tablatures – The fugue – Paix – Woltz – Luython – Luther’s hymns – Rise of the Choralvorspiel – Scheidt – Sweelinck – Decay of German tablatures – The organ was not at first used to accompany the choir or congregation – Scheidt’s directions for the management of the organ – His tonality – Forms of organ music settled in Germany. CHAPTER VIII. GERMAN ORGAN MUSIC (continued). Scheidemann – Reinken – Buxtehude – Bruhns – The South German school – Hassler – Kindermann – Schlemmer – Pachelbel – Steigleder – Erbach – Speth – Froberger and the legends concerning him – Kerl – Muffat – The Bach family. CHAPTER IX. ORGAN MUSIC IN GERMANY (continued). The organ works of J. S. Bach. CHAPTER X. FRENCH ORGAN MUSIC. The organ in France – First French publication – French tablature – Titelouze – Gigault – Raison – French preference for reed stops – Le Bègue – French organs – D’Anglebert – Chambonnières – The Couperins – Marchand – Rameau – Bedos de Celles. CHAPTER XI. ORGAN MUSIC IN SPAIN AND THE NETHERLANDS. Authorities for Spanish musical history – Music in a Spanish cathedral – Spanish organs – Cabezon – Spanish tablature – Hernando de Cabezon – Diego de Castillo – Cavigo – Arraujo – Lorente – Nassarre – Equal Temperament first proposed in Spain – Change of style in organ music – Eslava Portuguese music – Netherlands music – Bells and organs – Bull, Phillips, and other Englishmen in the Netherlands – Cornet – Van Gheyn – Sweelinck – Van Noordt. CHAPTER XII. ENGLISH ORGAN MUSIC. The organ in the English Church – University degrees – English tablature – Henry Abington – Cathedral music – Day’s Certaine Notes – Congregational singing – Tallis – Tye – Byrd – Blitheman – Bull – The Gibbons family – Abolition of the Liturgy. CHAPTER XIII. ENGLISH ORGAN MUSIC (continued). 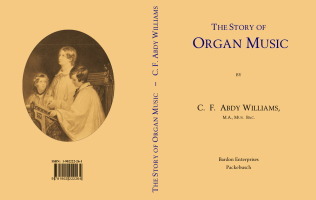 Re-erection of organs after the Restoration – The influence of the opera on church music – New use of the organ – Dr. Greene – John Robinson – Cornet pieces – Dr. Blow – Double and single organs – Croft – Purcell – His Toccata in A – His views of English music – Advent of Handel – Burney’s views of English instrumental music – Handel’s organ works – Mace and the organ in parish churches – Village church bands. CHAPTER XIV. CONTINENTAL ORGAN MUSIC SINCE 1750. Italian organ music – Vallotti – Santucci – Capocci – Terrabugio – Bossi – German organ music – W. F. Bach – Pupils of J. S. Bach – Rinck – Albrechtsberger – Vogler – The Schneiders – Mendelssohn – Hesse – Schumann – The Fischers – Faisst – Thiele – Ritter – Merkel – Rheinberger – Fährmann – Reger – French organ music – Benoist – Lambillotte – Nisard – Lefébure-Wély – Franck – Boèllmann – Saint-Saëns – Dubois – Guilmant – Widor – Dutch organists – Van Eijken – De Lange. CHAPTER XV. THE PROGRESS OF ORGAN MUSIC IN ENGLAND. Roseingrave – Arne – Stanley – Nares – Cooke – Dupuis – Beckwith – The Wesleys – Clarke-Whitfeld – Russell – Crotch – Novello – Adams – S. S. Wesley – Smart – Stirling – Spark – Ouseley – Best – The present English school. APPENDIX B. A Chronological Synopsis of Organ Composers. APPENDIX C. Bibliography and Collections of Organ Music.